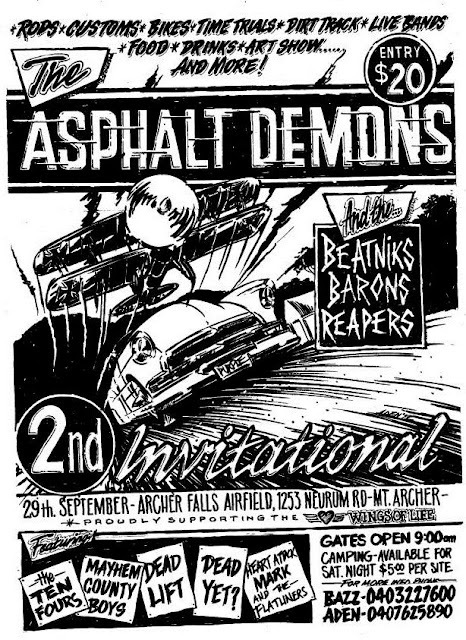 Rounding out the month of September is the Asphalt Demons 2nd Invitational at the Archer Falls Airfield in Mt Archer. The first one was HUGELY successful last year and I have to say it's certainly one of the coolest club days I've been to. Held on an old airfield, this is your chance to run your beast around the dirt track for a great cause. Helping to raise funds for the Wings of Life charity, entry is $20 and is probably the most fun you'll have in a long time. Gates open at 9 am and throughout the day rods, customs and bikes will have the chance to flat strap it around the dirt track and compete in the time trials. There's also an art show, food and drink as well as live bands and if you're so inclined, you can even camp overnight for just $5. This is definitely the reccommended option as you'll be having far too much fun to want to go home and the greasy breakfast put on the next morning is just what you'll nede to kickstart the drive back home. The Beatniks, Barons and Reaper car clubs will also be in attendence with trophies for the fastest as well as club choices. I may or may not have been in the Beatniks choice from last year ;) A family friendly day out, there's nothing more exhilarating than racing around the track at top speed as the 'Red Baron' takes off above you. One of the greatest days of gasoline and grease on the Brisbane calendar, I can't wait!